Scotland flanker John Barclay says Scarlets' reputation for flowing rugby was one of the main reasons behind his decision to leave Glasgow. The 26-year-old has to play for the Welsh region from the start of the 2013-14 season. "They've done the double on us this year... they've always had the wide, off-loading game and that's something that really appeals to me," he said. "That's one of the main reasons I joined was to try and play that style." But open-side Barclay has faith he will be playing in a Scarlets side that also has the power to compete up front. "They showed against us they've got the forward pack and strategically they're a very smart team as well," Barclay added. "I was looking around for a while and the opportunity to go to Scarlets came up, and it was one that straight away grabbed my attention. "I've always found it hard playing against Scarlets and also joining a club, a region that has such a proud history and tradition and fan base is something that really appealed to me." 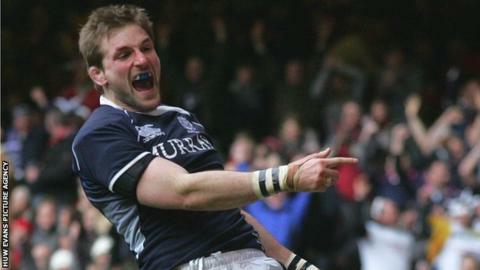 Barclay joined Glasgow at 17 in 2004 and has won 41 Scotland caps during his nine-year spell in Glasgow, but he fell down the pecking order this year after missing a sizable chunk of the season through injury. "Things have gone pretty well at Glasgow this year... although I was out for 12 weeks with a torn hamstring and I think before that maybe I wasn't playing as well as I have been and dropped out of the reckoning with Scotland," Barclay said. "Maybe for a year or two I've needed a change of scenery to freshen things up, because I've been at the club nine years and I think Scarlets is the perfect opportunity for me to do that. "I'm really looking forward to the challenge of playing down there with different players in a different atmosphere and testing myself. If Scotland selection comes off the back of that then that's really great."